Whether you connect them or use them alone, Multiplex Display and Exhibit Panels give you plenty of room to work with on both the front and back. 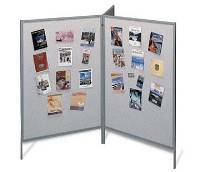 These panels feature self-healing vinyl tackboard that lets you post materials using push pins, thumbtacks or staples. Sturdy tubular frames have a baked enamel finish. Choose this in-stock model and receive three gray vinyl tackboard panels with light gray steel framework, plus connecting hardware. Set up quickly and easily. Include straight, 90" and 120" connecting brackets for multiple configurations. Allow for individual use with optional snap-lock feet. Panel dimensions: 48"W x 66"H (overall height = 78").